When a business or company currently produces wastewater in one way or another, it has to be contained and possibly purified or removed. Companies with this responsibility include garages, transport companies, valeting companies, car washing or mobile car wash outlets when washing vehicles, marinas and boatyards when hosing down and cleaning boats, dredging companies when collecting and purifying sludge etc. the fire brigade when collecting large quantities of contaminated drain water, and cattle breeders when collecting water during cleaning and disinfecting of vehicles. 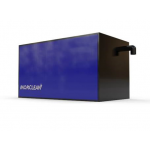 The Box range of products from Morclean offer an above ground partial water treatment system, and provide an alternative to costly and inconvenient ground works. They eliminate the need for excavation and give minimal disruption to the installation of interceptors and tanks.